Wargames can be long, arduous affairs as players think deeply about current and future moves but then have to start over when their opponent takes their turn. (No battle plan ever survives contact with the enemy.) This naturally pauses the game every turn and can quickly bog down a game. Wartime attempts to do an end-run around such problems by having players move their pieces simultaneously. Players use multiple sand timers to activate their troops. A troop can’t act again until its timer runs out and new troops can’t act unless there is a free timer available. While this sort of time pressure limits the possible complexity of the game, it greatly speeds up the pace and brings out the split-second decision making that occurs in actual combat. Games of Wartime start with a layout of two armies and any specific terrain for that scenario. Each army is comprised of units represented by a stack of unit discs placed on a central spool. Basic statistics for each unit are listed on top of the discs. The number of discs in a stack function as that unit’s hit points, with a unit remaining full strength until it is entirely eliminated. Combat is determined simply by comparing numbers, no dice or other random factors are involved. The game is not turn based. Instead, players are given a set of sand timers (typically one 30 second, two 60 second, and one 90 second timer) and can use a free unit whenever they have a completed timer available. In practice, once a timer is free players declare their intent (to avoid conflicts between conflicting actions), resolve the move or attack, and then flip the timer and place it next to the activated unit. That timer (and the unit) can not be used again until the timer runs out. Note, if the unit is eliminated, the timer must still run out before it can be reused. 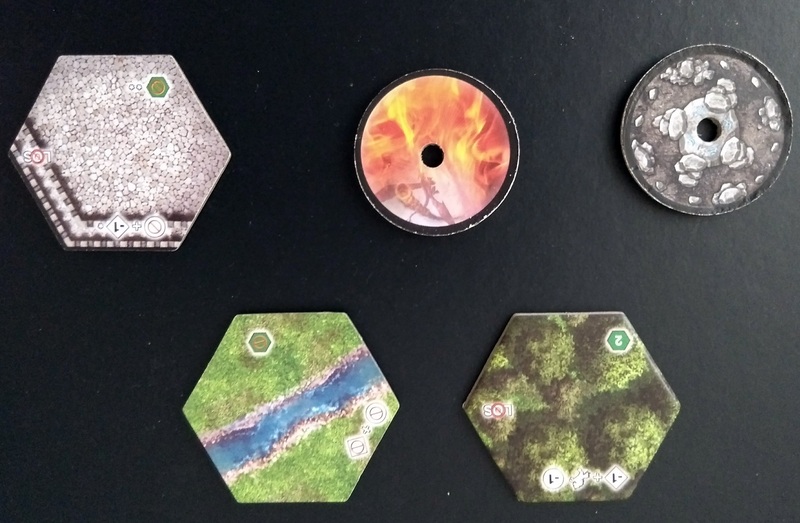 The game board is comprised of hexagons and battlefields are constructed using the included terrain tiles, with “destructible” terrain represented by their own stack of discs. Terrain comes in various styles and typically hinders or blocks movement and possibly reduces specific types of damage. To simplify things and keep the pace of the game high, there is no “line of sight” rule. Instead, ranged attacks simply “go around” blocking terrain, adding to the range of the attack. Thus, ranged attacks can bend around corners. A unit on the far side of a blocking hex is determined to be at range 3 (as it takes 3 hexes to count around the blocking obstacle.) Shooting around a corner may not seem realistic, but one could pretend they are effectively shooting over the obstacle and thus have lower accuracy. 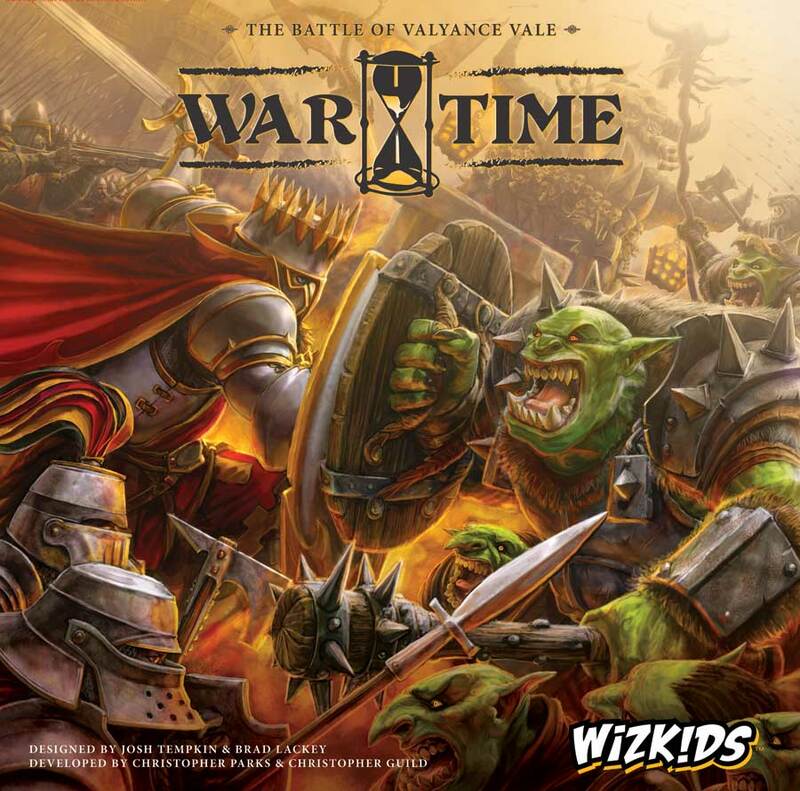 The game provides quick-start rules for a small skirmish between the two main armies in the game, the humans and the goblins. This walks players through the basic concept of battle with a small number of units and timers, but does not include terrain effects. Once players are familiar with the basic rules they can try out the included campaign set forth in the scenario book. The campaign consists of a series of three linked battles, with players scoring points at the end of each battle. The outcome of a battle determines which scenario is played next. In this way, the campaign consists of four possible routes (two possible outcomes at the end of each of the first two battles.) Winning one battle typically means the victor forces the loser into a defensive position for the following battle. 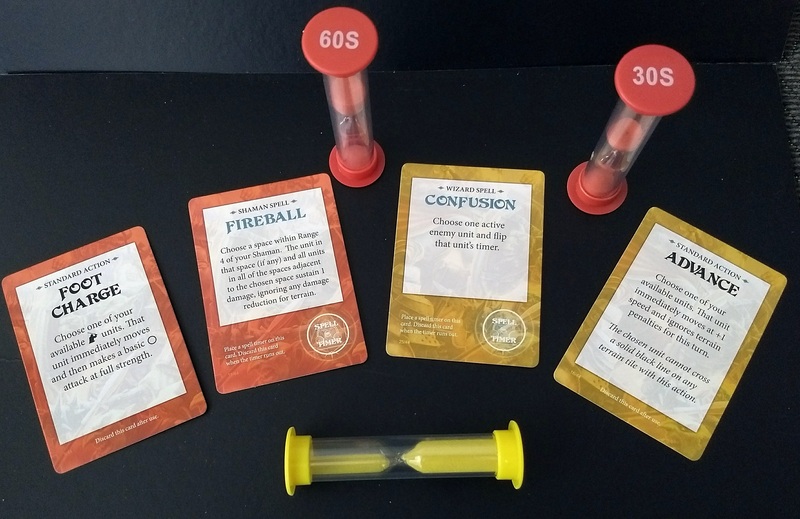 After the first battle in the campaign, players are allowed to choose action cards and (possibly) spells to assist them in a scenario. Action and spell cards are one-use abilities such as allowing a foot soldier to perform a charge or have a unit perform a double-move. Spell cards are associated with a specific type of unit. As long as a player has one of those units on the board they can cast that spell, placing a special spell timer on the card. When the timer runs out, another spell may be cast. The campaign book also includes three bonus scenarios that show off special units. In one, a necromancer continues to summon zombies until eliminated, another has a small contingent with a druid surrounded by goblins, and the third is a three player affair which has the goblin and human army joining forces against a rampaging black dragon. Not only does it have a full stack of health, it also has several special actions available to give is wide area attacks. I like the simplicity of the design. Ignoring line of sight issues and keeping terrain effects simple help to streamline the game and keep it moving. In keeping with the name, the constant time pressure has players juggling multiple goals at a time and can result in poor choices in battle, just like an actual conflict. The short time frame has the nice affect that a given battle can be played several times in a row in one sitting. The timers included with the game seem to be timed correctly. While things can get crowded during large melee skirmishes, there seemed to be room to keep them on the board during the game. I did, however, encounter a few times where one of the timers (usually one of the 90 second ones) became “stuck” during battle and the sand stopped flowing. While this could be a big deal, it was a rare occurrence and typically only happened to the 90 second one, meaning its effect on the game wasn’t huge. One can simply be diligent to double-check for the issue while playing, but as the stream of sand is rather small, it isn’t easy to see with a simple cursory glance. I think the rules for the game have great potential but think the game’s greatest weakness lies in the presented scenarios. While I would not claim to be an expert, I have concerns about the play balance of the two sides. 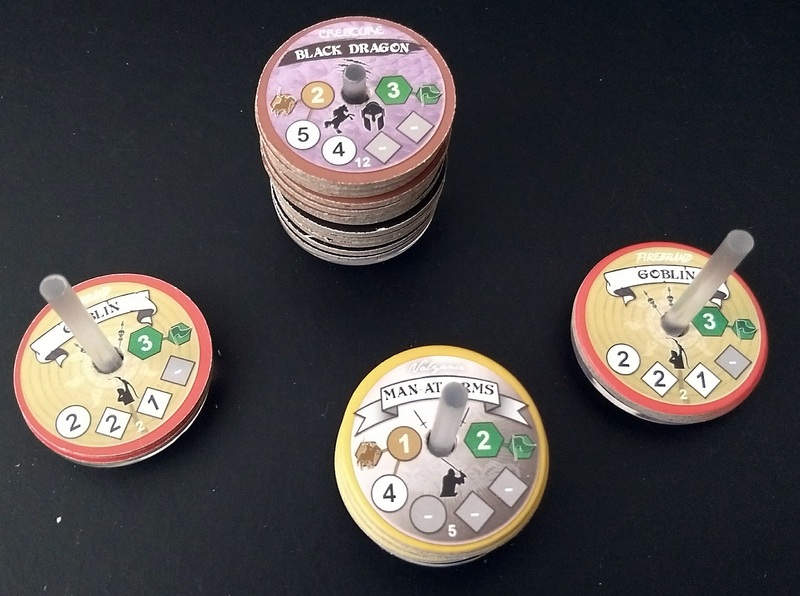 We’ve given the first few scenarios in the booklet quite a few tries (easy to do, since they play so quickly) and battles tend to be rather one-sided. One solution we’ve found is to swap sides after a battle and compare performances. However, this takes away from the whole idea of a branching campaign. For the curious, our take on the initial skirmish was that it favored the longer ranged human archers over the mobile goblins when terrain affects were taken into account. Our best goblin results bordered on a stalemate. The following scenario had the humans divided in two who typically were chewed to a pulp by the goblins before they could accomplish their mission of destroying the four altars. I haven’t finished all the bonus scenarios but hope they find a bit more balance. The campaign is a nice feature, but our play style (perhaps play balance?) has us playing some of the scenarios as stand-alone experiences since we never seem to branch down that path. A game of this type screams out for a make-your-own battle with units having a point-buy system. I realize that any useful dynamic system like that would require significant additional playtesting to balance. Combat tends toward frantic activity while timers are being setup, peppered with time while both sides are patiently waiting out their timers for the next move. More than once we ended up in a staring contest while the lives of our troops balanced on whether my in-progress 60 second timer was going to end just before his 30 second timer ran out. A three game campaign can easily be played in one sitting, although the games become even more obviously speedy when compared to the setup time. I found it more enjoyable to play the same scenario a couple of times before taking the time to switch over to a new setup. Wartime isn’t a perfect solution to every wargame problem, but it stakes out a unique niche in the genre. It’s real-time action and quick game play simulates the time-pressure on decisions made in battle.